Sir Hubert von Herkomer CVO RA (born as Hubert Herkomer; 26 May 1849 – 31 March 1914) was a German born British painter, and also a pioneering film-director and composer. Though a very successful portraitist, especially of men, he is mainly remembered for his earlier works that took a realistic approach to the conditions of life of the poor. Hard Times (1885; Manchester Art Gallery) showing the family of a travelling day-labourer at the side of a road, is probably one of his best known works. In a lengthy interview for Chums boys’ annual in 1896, Herkomer recalled his childhood: “We had an anxious time of it when I was a boy. We were constantly in want of money….. I was always inclined to art, and as a little boy worked principally at my father’s bench, but by the time I had turned twelve I had produced quite a number of water-colour drawings. The reputation I gained among my play fellows, however, was as a maker of kites”. He also crafted mechanical toys including clowns and wagons to give to his friends. He lived for some time at Southampton and in the school of art there began his art training. An uncle in America commissioned his father to carve the four evangelists in wood. Receiving some money his father determined to take Hubert to Munich so that he could study art whilst his father worked on the carving. In Chums, he recalled his trip vividly: “Ah, how I remember that first visit to Germany! … We crossed to Antwerp in a cattle boat … And never shall I forget the miseries of that voyage. And then there were the railway carriages on the other side. We were compelled to travel fourth-class, in the company of people who were no less filthy than the carriages; and I remember….. I swore a big oath that if ever I had any money I would travel in the most luxurious style possible. I have never forgotten that oath”. The pair led a hard life whilst in Munich, but he stated that “they were very happy days” and his father sat as model for him during that time. In 1866 he entered upon a more serious course of study at the South Kensington Schools and, in 1869, exhibited for the first time at the Royal Academy. He sold his first picture for two guineas but by the time he was twenty-four, he had sold a picture for five hundred pounds. In same year, he also began working as an illustrator for the newly founded newspaper The Graphic, a deliberate rival of the Illustrated London News. It was by his 1875 oil, The Last Muster, after a woodblock from 1871, that he definitely established his position as an artist of high distinction at the Academy. 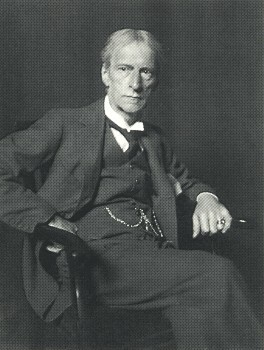 He was elected an associate of the Academy in 1879 and an academician in 1890, an associate of the Royal Watercolour Society in 1893 and a full member in 1894, and in 1885 he was appointed Slade Professor of Fine Art at the University of Oxford, a position he held until 1894. In 1899, he was ennobled as “Ritter von Herkomer” by King Otto of Bavaria, who appointed him Knight of the Merit Order of the Bavarian Crown. The same year, he was awarded the Pour le Mérite for Arts by Kaiser Wilhelm II. In 1907, he was knighted by King Edward VII. He exhibited a very large number of memorable portraits, figure subjects and landscapes, in oil and watercolour; he achieved marked success as a worker in enamel, as an etcher, mezzotint engraver and illustrative draughtsman and he exercised wide influence upon art education by means of the Herkomer School (Incorporated) at Bushey, which he founded in 1883 and directed without payment until 1904, when he retired. It was later voluntarily wound up in 1926 having been run up to that time by Lucy Kemp-Welch, and it is now defunct. Despite being a prominent member of Royal Academy of Arts, Royal Watercolour Society and the Royal Society of Painter-Etchers, as well as being on familiar terms with the royal family, Herkomer was never totally accepted by the British establishment, as he was ultimately a victim of the deteriorating relationship between the UK and Germany, where he shuttled in between, spending most of his summers in Bavaria. Herkomer’s massive house, Lululaund, named after Lulu Griffith, the second of his three wives, served as his studio, school, theatre and movie studio, where he put on productions of his own plays and musical compositions. It was designed by the prominent American architect Henry Hobson Richardson, for whom Herkomer painted a portrait. Four of his pictures, Found (1885), Sir Henry Tate (1897), Portrait of Lady Tate (1899) and The Council of the Royal Academy (1908), are in the national collection at Tate. In 1907, he received the honorary degree of DCL at Oxford, and a knighthood was conferred upon him by the king in addition to the commandership of the Royal Victorian Order with which he was already decorated. Herkomer was also a pioneering filmmaker. He established a studio in Lululaund and directed some seven historical costume dramas designed to be shown accompanied by his own music, but none of them seems to have survived. He had strong connections with Wales. His second wife hailed from Ruthin and he spent lengthy periods in Snowdonia painting with his friend, Charles Mansel Lewis from Stradey Castle, Llanelli. In 1899 he designed the Grand Sword of the Gorsedd of Bards, and he also designed some of its other regalia. Herkomer died at Budleigh Salterton on 31 March 1914 and was buried in St James’s church, Bushey. Herkomer has paintings in several British collections including the Manchester Art Gallery, Southampton City Art Gallery, Leeds Art Gallery, Lady Lever Art Gallery, Walker Art Gallery, Liverpool, Oldham, Derby Art Gallery and the City of London. The largest collection of his work is held by Bushey Museum, and some are in the Herkomer Museum, Landsberg am Lech, Germany. Among his pupils at The Herkomer School of Art, Bushey were many who later became notable in their own right including, the artist Cecil Jay. Precis Information is from the Mike W. Bucknole Thesis, Hubert Herkomer, his Life, his School and later achievements, Southampton Solent University 2000-2010.